A magical tool-kit of PRACTICAL tools to heal at the root cause and transform your own and other’s energies. What would life be like if you had simple tools to heal and transform physical pain, fears and anxieties? All at the root cause…. gently, quickly and easily? Imagine if you could release traumas from your system that have been preventing you living freely and fully… or release the “funny vibes” or strange energies that you feel between yourself, and other friends, family and co-workers. Whilst yoga and meditation give us many techniques to manage our self-healing, at Ibiza Retreats, we feel blessed and grateful to have discovered an amazing and magical toolkit for self-healing that really can enable you to heal yourself and live in your power with grace, and radiance. As founder of Ibiza Retreats, my journey has taken me over many bumpy roads, as part of my own journey to be able to offer an authentic space for others to experience healing and growth, my path has taken me through accidents and recovery, to dark places and into the shadows. For many years, I have been seeking a true master, of big heart and pure intentions, who I could truly relate to and who offered simple and effective techniques for managing and releasing energy. I had trained in many different genres, yoga, yoga therapy, life coaching, nlp, core energetics and energy healing – yet I wished I could find a way to hold the space better for me, my family, friends and for our guests on retreat. 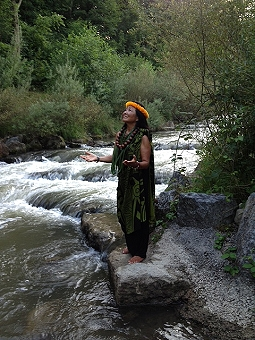 And so, as we seek we find, and this last year, through clients and dear friends, in Louise Mita I have found a true master of energetic medicine, who has developed a simple, powerful and unique system, incorporating the pearls of the wisdom and transformative keys from many ancient and metaphysical systems. Within 2 days of training, it can enable you to simply, quickly and easily define the root cause of dis-ease, physical pain, emotional unbalance, stress and pressures – both for yourself, your family, your clients and those around you. Ladies and gentlemen, lovers of holistic wellbeing, meet Louise Mita – and even better, come and enjoy a magical and life transforming experience with her yourself. IQM is, in its’ very essence, a uniquely created system of non-physical, non- contact, painless healing techniques. It incorporates eastern methods of energy healing, accessed by western physiology. And it’s a whole lot of magic! This way of healing takes you to the absolute source of every ailment. You connect to the emotional reasons that triggered the physical manifestation of the ailment and are able to heal and clear the initial / trigger situation or trauma. Make 2017 the year in which YOU open up your body and mind and immerse yourself in this unique system by reserving your heart space on our 2 day Ibiza Retreat IQM workshop from 21 -22 February.